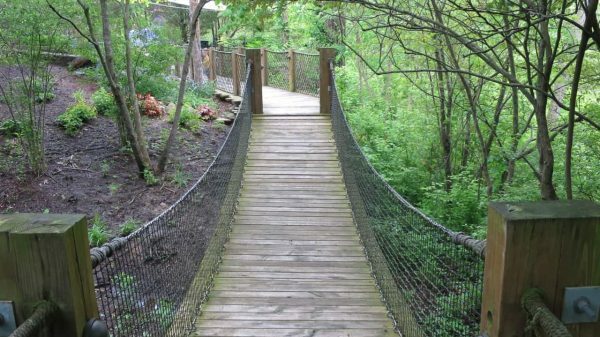 Here’s one Cincinnati area park you’ll want to visit if you have kids in tow…. The Highfield Discovery Garden, a hidden gem found at Glenwood Gardens. 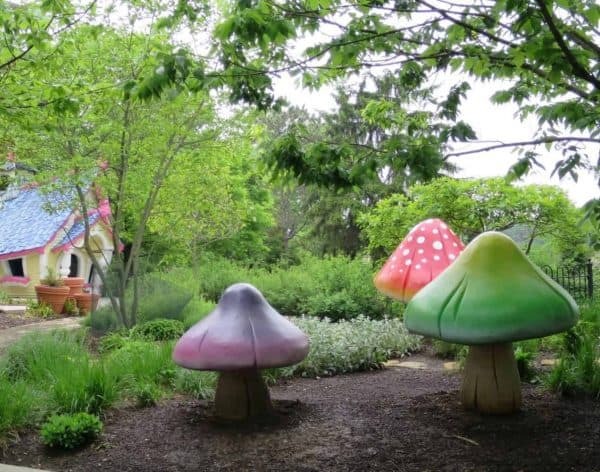 Part of Glenwood Gardens, this is a magical little place for kids. 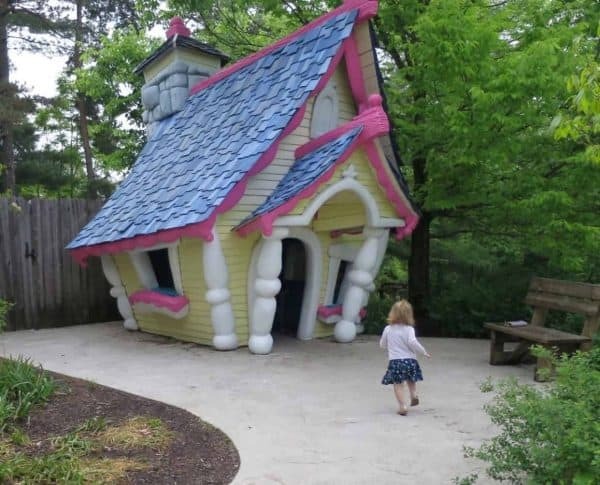 Spanning 12 acres, this park offers lots of opportunity for pretend play. 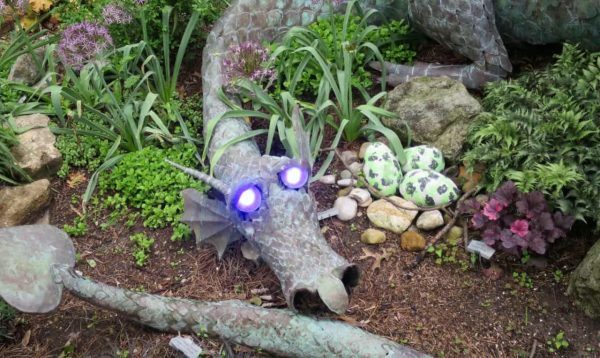 The entire park is full of nooks and crannies for littles – like a Fairy Garden guarded by a dragon with eyes that light up. There’s a magical hat into which a child can crawl. 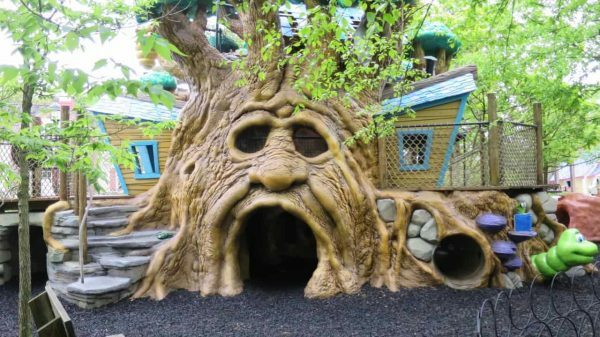 There’s a playground with a 25′ Discovery Tree where kids can crawl in and out of the holes, explore tunnels, and climb stairs. Next to the Discovery Tree you’ll find a train track along with a train engineer’s station where your little one can push buttons to make the trains move. Or perhaps a tea party is more your style? You’ll find a cute little table set for tea inside this little house. 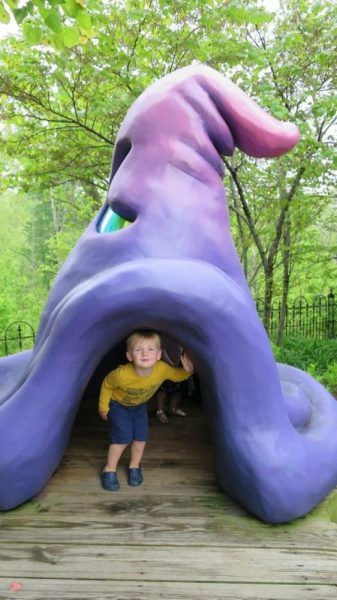 This park is packed full of opportunities to let your child’s imagination run wild. 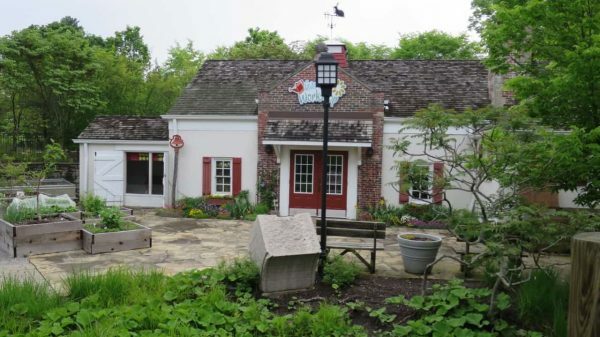 They have educational programs offered to the public and Highfield Discovery Garden pass holders. Programs are included for free with the cost of your admission. View the Highfield Discovery Garden calendar here. And there’s an entire walking loop below the main play area. The walking loop goes in and out of the woods and you’ll find a large pond there as well. 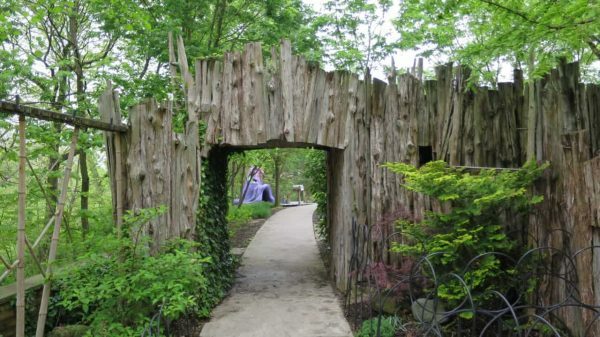 Highfield Discovery Garden can be found inside Glenwood Gardens, one of the wonderful Great Parks of Hamilton County. Pull into Glenwood Gardens and park in the lot. Walk up the loop to the main entrance (at the house) and walk under the vine covered arbor. You’ll find Highfield Discovery Garden’s entrance to the left. 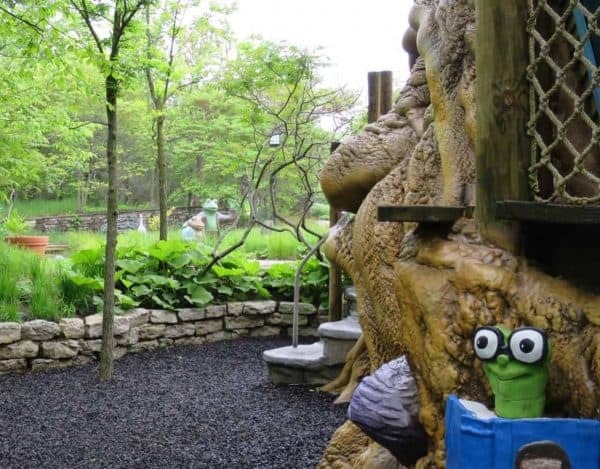 Admission to The Highfield Discovery Garden is $5/person with children under 2 free. You can also buy a year long pass for $50 for four people (any combination of adults and kids). Prices current in 2019. Hours can be found here. 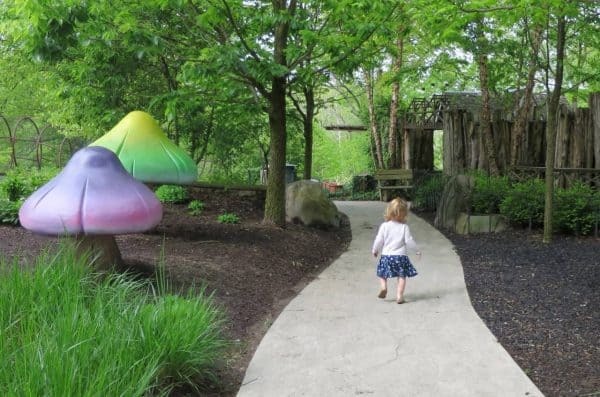 Highfield Discovery Garden is closed on Mondays all year round and they do have more limited hours in the winter so be sure to check on the date you’re visiting. You will need a Great Parks sticker for your car to enter Glenwood Gardens. I looked this up online and I can’t find clear directions to an entrance or a parking lot. Could you help with this please? Thank you. Hi Eileen, Highfield Discovery Gardens is within Glenwood Gardens. You would follow directions for Glenwood Gardens and park in that lot (plenty of parking). Follow the path into the park itself and you’ll see Highfield on the left after you walk under the arbor. You can’t miss it once you walk into the park from the parking lot. They are closed on Mondays from April to October.